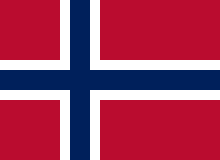 Norway (Norge) nye Europa dukɔwo dometɔ ɖeka. Ele Europa ƒe ɣedzeƒe lɔƒo. Norway do liƒo kple Finland, Russia kpakple Sweden. Eƒe dukɔmenɔlawo ƒe xexlẽme ɖo 5,328,212 lɔƒo (2019). Norway ƒe dugã enye Oslo. ↑ "Population, 2019-01-01". Statistics Norway. 2019-02-22. Retrieved 2019-03-31. Wotrɔ axa sia susuea le 11:41, 31 Tedoxe 2019.